We are a family of Christians who believe in God’s promise of salvation through His Son, Jesus Christ. We are here to help you on your journey to reach an eternal, spiritual home in Heaven. If you have questions about God, your soul, or the Church of Christ, we can help you find answers in God’s Word, the Bible. The Forum Terrace Church of Christ is located in the center of the Texas’ DFW Metroplex area. Since we are centrally located, we are easy to get to from multiple surrounding communities. 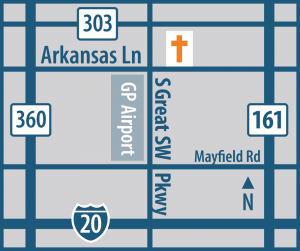 Specifically, we are located on the eastern border of Arlington in Grand Prairie. We’d love for you to come visit!